Ukrainian pilot cosmonaut 1965-1987. Member of first crew to fly between two space stations during a single mission. 374 cumulative days in space. Status: Deceased; Active 1965-1987. Born: 1941-08-05. Died: 2010-06-14. Spaceflights: 3 . Total time in space: 374.75 days. Birth Place: Krasnyi Liman, Donetsk. Graduated from Higher Air Force School, 1975 Soviet Air Force test pilot and parachutist. Cosmonaut training November 1965 - December 1967. Call sign: Mayak (Beacon). Later Deputy Director Satellite Control-Center of Russian Ministry of Defense. From May 1995 Director Military Engineering Academy of Aeronautics and Astronautics in St. Petersburg.. From 2001 retired from Air Force as General Colonel. Family: Cosmonaut. Country: Ukraine. Spacecraft: Salyut 6, Salyut 7, Mir. Flights: Soyuz T-2, Soyuz T-3, Soyuz T-6, Soyuz T-10-1, Soyuz T-10, Soyuz T-11, Soyuz T-15. Agency: VVS. Bibliography: 4452, 5628. 1941 August 5 - . Birth of Leonid Denisovich Kizim - . Nation: Ukraine. Related Persons: Kizim. Ukrainian pilot cosmonaut 1965-1987. Member of first crew to fly between two space stations during a single mission. 374 cumulative days in space. 3 spaceflights, 374.7 days in space. Flew to orbit on Soyuz T-3 (1980), Soyuz T-10, Soyuz T-15..
1965 October 23 - . Cosmonaut selection - . Nation: Russia. Related Persons: Degtyarev, Fyodorov, Glazkov, Grishchenko, Khludeyev, Kizim, Klimuk, Kolesnikov, Kramarenko, Lisun, Petrushenko, Preobrazhensky, Rozhdestvensky, Sarafanov, Sharafutdinov, Shcheglov, Skvortsov, Stepanov, Eduard, Voloshin, Yakovlev, Zudov. 1965 October 28 - . Soviet Air Force Cosmonaut Training Group 3 selected. - . Nation: Russia. Related Persons: Belousov, Degtyarev, Fyodorov, Glazkov, Grishchenko, Khludeyev, Kizim, Klimuk, Kolesnikov, Kramarenko, Lisun, Petrushenko, Preobrazhensky, Rozhdestvensky, Sarafanov, Sharafutdinov, Shcheglov, Skvortsov, Stepanov, Eduard, Voloshin, Yakovlev, Zudov. 1967 December - . Launch Vehicle: Spiral 50-50. New Spiral cosmonaut team - . Nation: Russia. Related Persons: Kizim, Kozelsky, Lyakhov, Malyshev, Petrushenko, Titov. Spacecraft Bus: Spiral 50-50. Spacecraft: Spiral OS. A new cosmonaut training group for the Spiral spaceplane was established: Titov, Kizim, Kozelskiy, Lyakhov, Malyshev, Petrushenko..
1980 June 5 - . 14:19 GMT - . Launch Site: Baikonur. Launch Complex: Baikonur LC1. LV Family: R-7. Launch Vehicle: Soyuz-U. Soyuz T-2 - . Call Sign: Yupiter (Jupiter ). Crew: Aksyonov, Malyshev. Backup Crew: Kizim, Makarov. Payload: Soyuz T s/n 7L. Mass: 6,850 kg (15,100 lb). Nation: Russia. Agency: MOM. Program: Salyut 6. Class: Manned. Type: Manned spacecraft. Flight: Soyuz 35, Soyuz T-2. Spacecraft Bus: Soyuz. Spacecraft: Soyuz T. Duration: 3.93 days. Decay Date: 1980-06-09 . USAF Sat Cat: 11825 . COSPAR: 1980-045A. Apogee: 232 km (144 mi). Perigee: 195 km (121 mi). Inclination: 51.60 deg. Period: 88.70 min. Test flight of new Soyuz T; docked with Salyut 6. Conducted testing and development of on-board systems in the improved Soyuz T series transport vehicle under piloted conditions..
1980 November 27 - . 14:18 GMT - . Launch Site: Baikonur. Launch Complex: Baikonur LC1. LV Family: R-7. Launch Vehicle: Soyuz-U. Soyuz T-3 - . Call Sign: Mayak (Beacon ). Crew: Kizim, Makarov, Strekalov. Backup Crew: Kovalyonok, Polyakov, Savinykh. Payload: Soyuz T s/n 8L. Mass: 6,850 kg (15,100 lb). Nation: Russia. Agency: MOM. Program: Salyut 6. Class: Manned. Type: Manned spacecraft. Flight: Soyuz T-3. Spacecraft Bus: Soyuz. Spacecraft: Soyuz T. Duration: 12.80 days. Decay Date: 1980-12-10 . USAF Sat Cat: 12077 . COSPAR: 1980-094A. Apogee: 260 km (160 mi). Perigee: 256 km (159 mi). Inclination: 51.60 deg. Period: 89.70 min. Manned three crew. Docked with Salyut 6. Tested the improved transport ship of the 'SOYUZ T' series; transported to the Salyut-6 orbital station a crew consisting of L D Kizim, O G Makarov and G M Strekalov to carry out repair and preventive work and scientific and technical investigation and experiments. 1980 December 10 - . Landing of Soyuz T-3 - . Return Crew: Kizim, Makarov, Strekalov. Nation: Russia. Related Persons: Kizim, Makarov, Strekalov. Program: Salyut 6. Flight: Soyuz T-3. Soyuz T-3 landed at 09:25 GMT. .
1982 June 24 - . 16:29 GMT - . Launch Site: Baikonur. Launch Complex: Baikonur LC1. LV Family: R-7. Launch Vehicle: Soyuz-U. Soyuz T-6 - . Call Sign: Pamir (Pamirs ). Crew: Chretien, Dzhanibekov, Ivanchenkov. Backup Crew: Baudry, Kizim, Solovyov, Vladimir. Payload: Soyuz T s/n 9L. Mass: 6,850 kg (15,100 lb). Nation: Russia. Agency: MOM. Program: Salyut 7. Class: Manned. Type: Manned spacecraft. Flight: Soyuz T-5, Soyuz T-6. Spacecraft Bus: Soyuz. Spacecraft: Soyuz T. Duration: 7.91 days. Decay Date: 1982-07-02 . USAF Sat Cat: 13292 . COSPAR: 1982-063A. Apogee: 233 km (144 mi). Perigee: 189 km (117 mi). Inclination: 51.70 deg. Period: 88.70 min. Manned three crew. Docked with Salyut 7. Transported to the Salyut-7 orbital station the Soviet-French international crew, comprising V A Dzhanibekov (USSR), A S Ivanchenkov (USSR) and Jean-Loup Chretien (France) to conduct scientific research and experiments. 1983 September 26 - . 19:37 GMT - . Launch Site: Baikonur. Launch Complex: Baikonur LC1. LV Family: R-7. Launch Vehicle: Soyuz-U. FAILURE: Launch vehicle blew up on pad.. Failed Stage: 0. Soyuz T-10-1 - . Call Sign: Okean (Ocean). Crew: Strekalov, Titov, Vladimir. Backup Crew: Kizim, Solovyov, Vladimir. Payload: Soyuz 7K-ST s/n 16L. Mass: 6,850 kg (15,100 lb). Nation: Russia. Agency: UNKS. Program: Salyut 7. Class: Manned. Type: Manned spacecraft. Flight: Soyuz T-10-1, Soyuz T-9. Spacecraft Bus: Soyuz. Spacecraft: Soyuz T. Duration: 0.0001 days. Decay Date: 1983-09-27 . Apogee: 2.00 km (1.20 mi). Aborted September 27, 1983 19:38 GMT. Unsuccessful mission. Launch vehicle blew up on pad at Tyuratam; crew saved by abort system..
1984 February 8 - . 12:07 GMT - . Launch Site: Baikonur. Launch Complex: Baikonur LC31. LV Family: R-7. Launch Vehicle: Soyuz-U. Soyuz T-10 - . Call Sign: Mayak (Beacon ). Crew: Atkov, Kizim, Solovyov, Vladimir. Backup Crew: Polyakov, Savinykh, Vasyutin. Payload: Soyuz 7K-ST s/n 15L. Mass: 6,850 kg (15,100 lb). Nation: Russia. Agency: MOM. Program: Salyut 7. Class: Manned. Type: Manned spacecraft. Flight: Soyuz T-10. Spacecraft Bus: Soyuz. Spacecraft: Soyuz T. Duration: 62.95 days. Decay Date: 1984-04-11 . USAF Sat Cat: 14701 . COSPAR: 1984-014A. Apogee: 219 km (136 mi). Perigee: 199 km (123 mi). Inclination: 51.60 deg. Period: 88.70 min. Manned three crew. Docked with Salyut 7. Transported a crew consisting of ship's commander L D Kizim, flight engineer V A Solovyov and cosmonaut-research O Y Atkov to the SALYUT-7 orbital station to conduct scientific and technical studies and experiments. 1984 April 23 - . 04:31 GMT - . EVA Salyut 7 EO-3-1 - . Crew: Kizim, Solovyov, Vladimir. EVA Duration: 0.18 days. Nation: Russia. Related Persons: Kizim, Solovyov, Vladimir. Program: Salyut 7. Class: Manned. Type: Manned space station. Flight: Soyuz T-10. Spacecraft Bus: Almaz. Spacecraft: Salyut 7. Installed external equipment..
1984 April 26 - . 02:40 GMT - . EVA Salyut 7 EO-3-2 - . Crew: Kizim, Solovyov, Vladimir. EVA Duration: 0.21 days. Nation: Russia. Related Persons: Kizim, Solovyov, Vladimir. Program: Salyut 7. Class: Manned. Type: Manned space station. Flight: Soyuz T-10. Spacecraft Bus: Almaz. Spacecraft: Salyut 7. Began repair of Salyut 7 propulsion system fuel lines..
1984 April 29 - . 01:35 GMT - . EVA Salyut 7 EO-3-3 - . Crew: Kizim, Solovyov, Vladimir. EVA Duration: 0.11 days. Nation: Russia. Related Persons: Kizim, Solovyov, Vladimir. Program: Salyut 7. Class: Manned. Type: Manned space station. Flight: Soyuz T-10. Spacecraft Bus: Almaz. Spacecraft: Salyut 7. Continued repair of Salyut 7 propulsion system fuel lines..
1984 May 4 - . 23:15 GMT - . EVA Salyut 7 EO-3-4 - . Crew: Kizim, Solovyov, Vladimir. EVA Duration: 0.11 days. Nation: Russia. Related Persons: Kizim, Solovyov, Vladimir. Program: Salyut 7. Class: Manned. Type: Manned space station. Flight: Soyuz T-10. Spacecraft Bus: Almaz. Spacecraft: Salyut 7. Completed repair of Salyut 7 propulsion system fuel lines..
1984 May 18 - . 17:52 GMT - . EVA Salyut 7 EO-3-5 - . Crew: Kizim, Solovyov, Vladimir. EVA Duration: 0.13 days. Nation: Russia. Related Persons: Kizim, Solovyov, Vladimir. Program: Salyut 7. Class: Manned. Type: Manned space station. Flight: Soyuz T-10. Spacecraft Bus: Almaz. Spacecraft: Salyut 7. Installed solar array..
1984 August 8 - . 08:46 GMT - . EVA Salyut 7 EO-3-6 - . Crew: Kizim, Solovyov, Vladimir. EVA Duration: 0.21 days. Nation: Russia. Related Persons: Kizim, Solovyov, Vladimir. Program: Salyut 7. Class: Manned. Type: Manned space station. Flight: Soyuz T-10. Spacecraft Bus: Almaz. Spacecraft: Salyut 7. Repaired Salyut 7 propulsion system fuel lines..
1984 October 2 - . Landing of Soyuz T-11 - . Return Crew: Atkov, Kizim, Solovyov, Vladimir. Nation: Russia. Related Persons: Atkov, Kizim, Solovyov, Vladimir. Program: Salyut 7. Flight: Soyuz T-10. Soyuz T-11 landed at 10:57 GMT with the crew of Atkov, Kizim and Solovyov Vladimir aboard..
1986 March 13 - . 12:33 GMT - . Launch Site: Baikonur. Launch Complex: Baikonur LC1. LV Family: R-7. Launch Vehicle: Soyuz-U2. Soyuz T-15 - . Call Sign: Mayak (Beacon ). Crew: Kizim, Solovyov, Vladimir. Backup Crew: Aleksandrov, Viktorenko. Payload: Soyuz T 11F732 s/n 21L. Mass: 7,020 kg (15,470 lb). Nation: Russia. Agency: MOM. Program: Mir. Class: Manned. Type: Manned spacecraft. Flight: Soyuz T-15. Spacecraft Bus: Soyuz. Spacecraft: Soyuz T. Duration: 125.00 days. Decay Date: 1986-07-16 . USAF Sat Cat: 16643 . COSPAR: 1986-022A. Apogee: 366 km (227 mi). Perigee: 331 km (205 mi). Inclination: 51.60 deg. Period: 91.50 min. Mir Main Expedition EO-01. Epic repair mission. The crew, consisting of ship's commander L D Kizim and flight engineer V A Solovyov first docked with the Mir orbital station to conduct scientific and technical studies and experiments. Mir then maneuvered 17 April to match Salyut 7's orbit at 4000 km separation, then again on 4 May to catch up. After six weeks aboard Mir, Soyuz T-15 undocked on 5 May, then rendezvoused and manually docked with the inoperative Salyut 7 station. This was the only flight in history by a single spacecraft between two space stations. The Salyut-7 station was found to be ice bound and without electrical power. The crew repaired the station, regaining power, heat, and environmental control. The also removed experimental results left behind by last crew. Soyuz T-15 undocked Salyut 7 on 25 June, and redocked with Mir on 26 June, delivering 400 kg of scientific material from Salyut 7, including a multichannel spectrometer. Following further work aboard Mir, the crew landed on July 16, 1986 at 12:34 GMT. No crew ever revisited Salyut 7; it made an uncontrolled reentry over Argentina. 1986 May 28 - . 05:43 GMT - . EVA Mir EO-1-1 - . Crew: Kizim, Solovyov, Vladimir. EVA Duration: 0.16 days. Nation: Russia. Related Persons: Kizim, Solovyov, Vladimir. Program: Mir. Class: Manned. Type: Manned space station. Flight: Soyuz T-15. Spacecraft: Mir. Installed truss on exterior of Salyut 7..
1986 May 31 - . 04:57 GMT - . EVA Mir EO-1-2 - . Crew: Kizim, Solovyov, Vladimir. EVA Duration: 0.21 days. Nation: Russia. Related Persons: Kizim, Solovyov, Vladimir. Program: Mir. Class: Manned. Type: Manned space station. Flight: Soyuz T-15. Spacecraft: Mir. Tested truss structure on exterior of Salyut 7..
1986 July 16 - . Landing of Soyuz T-15 - . Return Crew: Kizim, Solovyov, Vladimir. Nation: Russia. Related Persons: Kizim, Solovyov, Vladimir. Program: Mir. Flight: Soyuz T-15. Soyuz T-15 landed at 12:34 GMT, 55 km NE of Arkalyk..
2010 June 14 - . Death of Leonid Denisovich Kizim - . Nation: Ukraine. Related Persons: Kizim. 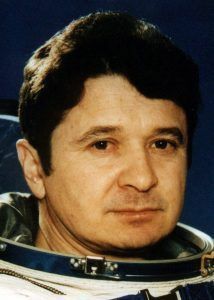 Ukrainian pilot cosmonaut 1965-1987. Member of first crew to fly between two space stations during a single mission. 374 cumulative days in space. 3 spaceflights, 374.7 days in space. Flew to orbit on Soyuz T-3 (1980), Soyuz T-10, Soyuz T-15..